BED AND BREAKFAST ACCOMODATION ON SKYE, AT A'CHUIBHEALL, TORRIN. If you are looking for bed and breakfast accommodation on the Island of Skye for a few days, Rob and Meg Miller are waiting to welcome you into their home at A' Chuibheall and introduce you to the best of Skye. A'Chuibheall will provide you with comfortable accommodation in a relaxing setting and an excellent base for exploring the Island. Here in Torrin you can enjoy the peace, and quiet solitude, of south west Skye to a backdrop of one of the best views on the island. 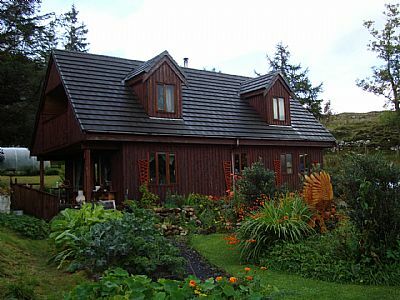 A' Chuibheall is situated in the small picturesque crofting village in S.W Skye.It sits on the edge of Loch Slapin, and is surrounded by the Red and Black Cuillin mountains. Fabulous if you enjoy walking, climbing and swimming in sea & river. Torrin also has a small cafe 'The Blue Shed' which serves delicious homemade cakes and coffee. We offer bed and breakfast accommodation all year round. We have one double bedroom with a private toilet and shower room, free Wi-fi and laundry facilities. We especially welcome guests who want to experience the beauty of the Skye hills and coastline at first hand and we are very much a walker, cyclist and biker friendly bed and breakfast. We look forward to meeting you and sharing with you the never ending adventure of discovering the island of Skye. If you have any allergies to insect stings and bites please be aware that we are bee keepers and you are likely to see bees in and around our garden.